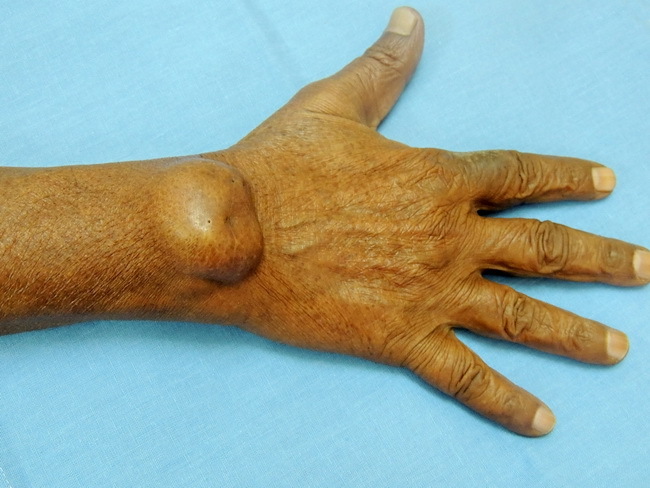 Recurrent fibroma of tendon sheath on the dorsum of the right wrist of a 49 y/o male. Most of the cases present as a small, slow-growing nodule, firmly attached to the tendon sheath in the extremities. Fingers, hands, and wrist are the most common sites of involvement. Note the dimpled scar from the previous resection. Courtesy: Dr. Madhav Khadilkar & Dr. Sanjay D. Deshmukh, Department of Pathology, Smt. Kashibai Navale Medical College, Pune, India.